The Education Act, 2009 allows various educational bodies to “authorize, supervise and evaluate the use of distance learning programs in the provision of the education program” (p. 72). The Department of Education, Culture and Employment defines distance learning as the deliberate use of the Internet, the world wide web, and landlines to leverage communication tools, learning management systems, and resources to overcome geographic obstacles to accessing brick and mortar courses, disciplinary expertise, and student cohort formation. Since 2004, the Department has had a Memorandum of Understanding (MOU) with the Alberta Distance Learning Centre (ADLC), which has historically been the main provider of distance education for Northwest Territories students. Additionally, section 3.3 of the Northwest Territories School Handbook outlines a series of requirements that schools must adhere to in order to participate in distance learning. While the document is primarily focused on describing distance learning and specific operational items related to schools participation in the ADLC, it does recommend that schools have a dedicated online facilitator, scheduled distance learning time in student timetables, a plan for students to complete courses in a timely manner, and access to additional relevant resources. The Northwest Territories is halfway through implementing a renewal of its system of education through a process called Education Renewal and Innovation (ERI). One commitment under ERI is to improve the learning experience of students in its smallest communities, regardless of geographical location. The territorial government has made the development of and support for building its internal distance learning capacity a priority. Beginning in 2014, the Government of the Northwest Territories formed a partnership with one of the school districts to test and expand a pilot called Northern Distance Learning (NDL) that facilitated high school academic classes in small communities through videoconferencing from a host school in Inuvik. Through use of an MOU in 2018, Education, Culture & Employment (ECE) and Beaufort Delta Education Council (BDEC) formalized a partnership to expand Northern Distance Learning (NDL) to all small community high schools. The program’s vision is to enable students to stay in their home communities, meet graduation requirements of high school, and prepare to enter postsecondary programs directly from high school. This program is largely funded by ECE through contribution agreements with participating divisional educational bodies. Participating schools make a contribution towards defraying some of the costs. The NDL program is currently in its first year of a three-year expansion. NDL teachers are based in Inuvik, typically with a small number of students from the host school enrolled in classes taught by these teachers. Students in eight other schools access the course material online from their respective schools with the help of a local support person, and interact with the teacher and classmates through videoconferencing. The program uses Moodle for its learning management system. During the 2017-18 school year 52 students were enrolled in NDL. Additionally, there were approximately 41 students enrolled in distance learning courses offered through the ADLC during the 2017-18 school year. The Department of Education, Culture and Employment defines blended learning as a formal education program where students learn in part through online delivery of content and instruction, and in part in a brick and mortar setting. NDL intends to develop programming that will gradually replace some live classes with fully asynchronous classes in the learning management system. The Department of Education, Culture and Employment reported approximately 100 students engaged in blended learning during the 2017-18 school year. 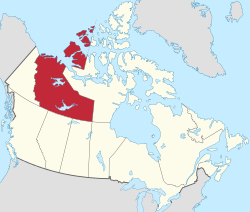 The Northwest Territories (NWT) have always had close secondary and post-secondary ties to Alberta. Since mid-2000 the NWT had used the Alberta Distance Learning Centre versions of their secondary courses for high school students who did not have access to these courses in their small community high schools, or have schedule conflicts in their brick and mortar settings. In 2011, the Beaufort Delta Education Council (a regional board of education known as ‘BDEC’) took the initiative to bring high school programming to some remote communities through use of teleconferencing and email files. This approach was chosen because the bandwidth to those communities was at dial-up speed. Within just a few years the technology and bandwidth improved enough to include screen sharing with telephone audio. Concurrent with these efforts, the Department of Health and Social Services in partnership with the Federal Government developed the use of videoconferencing units for tele-speech service in each community with units deployed in both the school and health centers. This involved improvements to the NWT’s digital community network (DCN) and the purchasing of a video bridge service. BDEC decided to make greater use of the videoconferencing units to better develop the relationships between all participants in the distance learning program. With the units online all day long for classes, it was determined quite quickly that the DCN could not sustain the video quality of service required for ongoing use in this fashion. Since 2011, BDEC has been partnering with the Department of Education Culture and Employment to develop their ‘elearning’ program. In 2013, BDEC decided to purchase the use of an external network that could meet the demands of day-long synchronous learning. The network facilitates live ‘face to face relationship building’ communications through the facilitation of a local support person dedicated full time to students at each participating site. All courses, learning materials and resources are managed through the learning management system Moodle. The three participating boards of education have agreed to harmonize their calendars during this pilot. If a student in the Northwest Territories were to take a distance education course from any provider in the Province of Alberta it would be accepted by the Department of Education, Culture and Employment as the territories follow the Alberta curriculum. However, if the student were to complete a distance education course from any other jurisdiction it would have to be evaluated by a “Special Cases” committee before credit could be granted. Students from outside of the Northwest Territories are not eligible to enroll in the territories’ distance education programs.